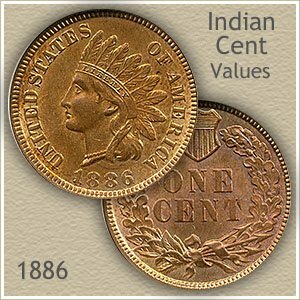 1886 Indian head penny value is higher than the commonly found dates of the 1890s and 1900s. Your coin is a nice find with good value. However in just lightly worn or better condition it is a scarce coin. Collectors and dealers place a higher value on 1886 pennies showing bold details within the headband and ribbon along her neck. Subtle points affecting value are described and imaged below. Secondly: Adding to an already above average price is the possibly your coin was minted with the scarce design change used on part of the 1886 pennies. Well into production for that year the design of the Indian headdress was modified. Fewer of these redesigned coins were minted creating a valuable penny. The different design variety is easy to distinguish, images of each are below. Also when judging condition, carefully compare your coin to the "grading" descriptions to pick up the subtle differences. 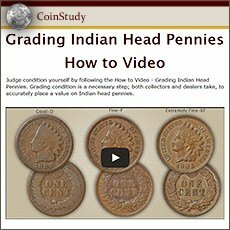 Both the condition and variety determine accurately how much your 1886 Indian head penny is worth. Towards the end of minting 1886 pennies a visible change in the design was adopted. Placement of the feathers in the headdress and how they relate to the lettering along the rim was redesigned. Up until then the last feather of the headdress pointed between the "I" and "C" of America, known as Type I. The new design now points the last feather between the "C" and "A" of America creating the Type II variety. In 1886 pennies received this new look that continued until the end of the series. The evolution of Indian pennies includes a design change on the reverse and different metal alloys used in the early years. Later adding the designer's initial in 1864 and in 1886 a redesign of the obverse. 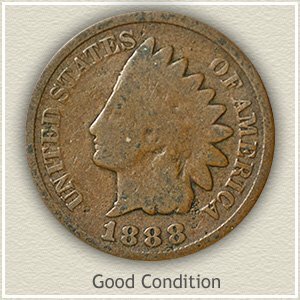 A now very different penny has become a popular and fascinating coin to collect, your 1886 Indian head penny value is always strong due to demand. Today’s demand from collectors and dealers exceeds the small supply of better quality, well preserved 1886 pennies. The majority of these coins are no longer with us. Determine if your coin is a higher grade worth a large premium. The value chart lists coins in these different "grades" depending on the amount of wear. Known as grading, compare your coin to the images and find the best match. 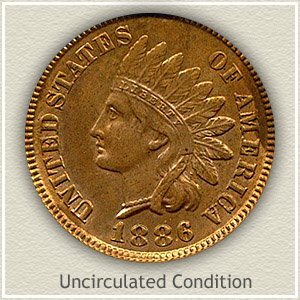 Uncirculated: With the highest demand and 1886 Indian head penny value are coins that never circulated. It is very rare to find coins in the same condition as they left the mint, with no wear to their surfaces. Amazingly there are a select few known with the original bright mint luster radiating across the surface. Confirm your coin is "uncirculated" by examining the very highest points of design. The ends of the feathers and her cheek are two areas that would quickly appear dull and slightly smooth from the lightest of wear. Rotate the coin under a light, wear shows as a disruption in the luster as it travels around the coin. Extremely Fine: An Indian penny in "extremely fine" condition is well defined in all areas of the design. Boldly rounded and separated are the hair curls and headdress ribbon below her ear. The headband remains very detailed with every letter in "Liberty" complete and sharply defined. Overall a nice coin with some light wear that does not detract from its appearance. Fine: Pulled from circulation with ample detail remaining, Indian pennies in "fine" condition are pleasing. Her face and hair are fully separated with rounded contours. Lettering and date is bold. From the top of the headband, following her forehead and down behind her ear are the highest points of design. It is these areas that wear removes much of the finer detail. 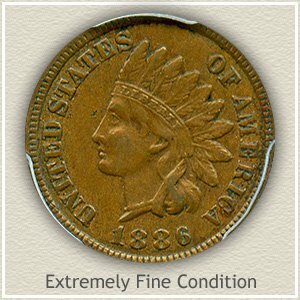 A nice collectible coin, your 1886 Indian head penny value is now above $12 to $15. Good: A complete outline of the feathers, her face and neckline is separated and raised from the background. Lettering is distinct as well as the date. All other parts of the design are now worn away. However, your coin is still enjoyed by many young collectors, especially the 1886 Type II variety. A very popular coin, everyone understands and has heard of the value of an Indian Head penny. Common dates are now worth one dollar each. 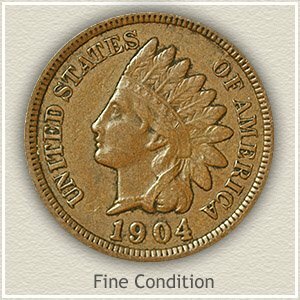 Many collectors are building collections and putting a large premium on not only your 1886 Indian head penny value but also the very rare dates and better condition coins. Compare your coins to the values chart.